David Miliband’s parting shot before leaving Britain was an interview with Andrew Marr where he argued that the Tories can win a majority at the next general election. At the same time, serious forces inside the Conservative Party argue that they have no hope of winning in 2015. They can’t both be right. SEB has argued over a prolonged period that the Tory Party is in decline. In 2009 and 2010 articles published here correctly forecast that the Tories would be unable to gain an overall a majority, even though they had recently been running very strongly in the polls. From the same analysis it is possible to predict that the Tory vote will fall below the 36% secured at the last election and indeed the Tories will have difficulty in gaining substantially over 30% of the vote in 2015. As a result David Miliband is completely wrong, the Tories will be unable to form a majority government. The analysis of the Tory decline is based on long-established trends. These trends reflect changes in British society and its role in the world. In effect the Tory party expanded beyond its strongholds in the shires - especially in the South and South-East excluding London - as Britain expanded its role in the world. As Britain’s imperial role declined and society altered, so too did the electoral support for the Tories, with some time lag. Tory electoral support is being pushed back to its original heartlands in the south outside of London. The full basis for this analysis first appeared in 1983 in John Ross’s Thatcher and Friends. This can now be found in its entirety on this blog here. 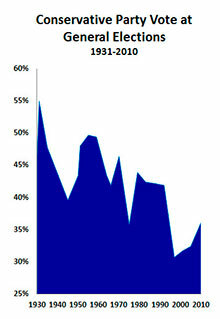 The chart below shows the declining trend in Tory support in actual general elections rather than opinion polls. This key fact, so routinely ignored by innumerable political commentators now including David Miliband, was first identified in 1983. 30 years later it still holds true. If the Tories vote in 2015 were strictly on trend, and they suffer an electoral defeat, it will fall back to 30.3%. The siren song of David Miliband, and others on the Labour right, that the Tories are most likely to win in 2015 is coupled to an argument that they only way to prevent this is for Labour to adopt Tory policies. This is entirely false. The consistent decline of the Conservative votes shows that Tory policies have been unattractive, not attractive, to voters. It has been Scottish and Welsh Nationalists, and the Liberal Democrats, that have gained votes. Labour’s recent swing towards Tory policies has therefore completely foreseeably led to no increase in support at all – but will demoralise a significant number of potential Labour supporters. Miliband and the Labour right’s argument are pitted against not just the current opinion polls but against the whole post-war trend in Tory support. The latest GDP release from the Office for National Statistics was accompanied by a set of revisions to previous data. These now show that the downturn was more severe than had previously been estimated and that the British economy is even further away from recovery. Previously, ONS data had shown that six years into economic slump the economy was still 2.6% below its pre-recession peak in the 1st quarter of 2008. Now it shows that the economy is actually 3.9% below its peak. The economy is still £61bn below the peak level. 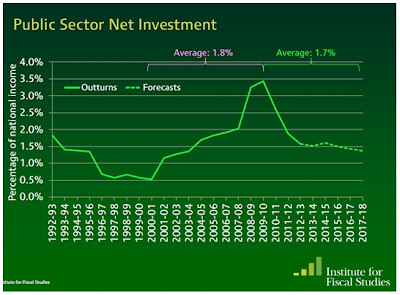 Yet it remains the case that the fall in investment more than accounts for the entirety of the recession, as shown in Fig. 1. 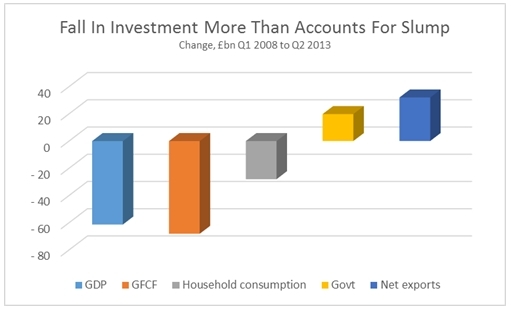 Investment (Gross Fixed Capital Formation) has fallen by £68bn. 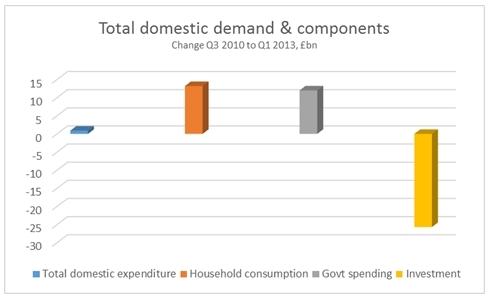 The other main component of GDP which has contracted is household consumption, which is down by £28bn. This demonstrates the effects of falling real wages on living standards. It effectively accounts for half the recession, but it is not as severe as the decline in investment. By contrast government spending is £20bn higher, despite all the propaganda about the absolute priority of deficit reduction. This is because government policy is not primarily aimed at curbing spending at all, otherwise PFI, Trident and subsidies to corporations would all go. The aim is to boost profits, which means cutting wages, cutting government investment in areas where the private sector can return profits and redirecting the social surplus towards capital. 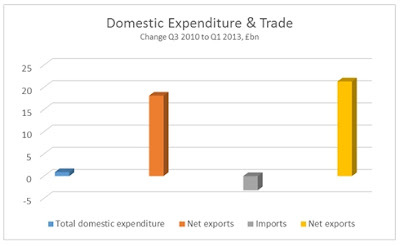 Net exports are also £32bn higher. The government and its supporters are inclined to blame Europe, or foreigners in general for their own failed economic policy. It should be noted that the rise in net exports has very little to do with the increased sale of goods and services overseas. Despite a very large devaluation for Sterling exports are only £6bn higher at the beginning of 2013 than at the beginning of 2008. By far the larger component of the rise in net exports has been the fall in imports, down £26bn over the same period. It seems that both households and firms in Britain are being priced out of world markets. It should be clear from the much greater fall in imports that it is Britain which is a drag on the world economy, not vice versa. 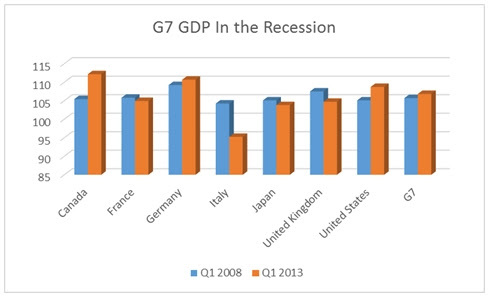 In fact the British economy has been one of the worst performers in the G7, which itself has performed very poorly. As a whole the G7 economy is just 1.1% above its pre-recession peak at the beginning of 2008. The British economy’s performance still 3.9% below its prior peak placing it in the rear of the G7, on a par with Japan and ahead only of Berlusconi’s Italy. The slump has been followed by stagnation. The effect of the downward revisions to GDP is to increase the gap between the economy’s previous trend rate of growth and its current level. As a result the economy is already nearly 20% below its previous trend rate and even on official forecasts that gap is set to widen over the next period. 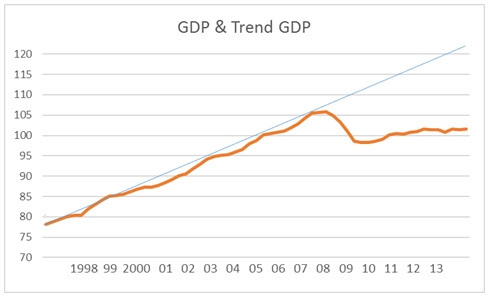 The economy is about £350bn below its previous trend. This gives a measure of the scale of the crisis facing an incoming Labour government, which cannot be remedied without a commensurate level of investment in the economy. The Tory-led government has no intention of increasing investment. The much-hyped infrastructure investment plan was entirely fake. 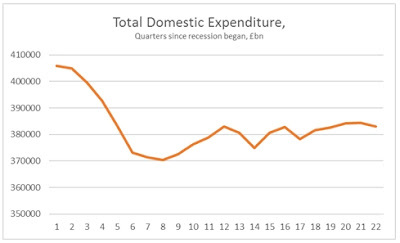 As the chart from the Institute for Fiscal Studies reproduced below shows, government investment is being cut. The Tories regard the returns available from this investment as belonging to the private sector. The cut to investment is to allow the private firms to invest and so reap the benefits. But there is no evidence that the private sector regards these as sufficiently profitable. As a result the cuts to government investment are simply exacerbating the slump in private investment. 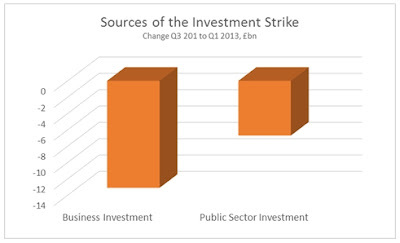 A Labour government would need to break this investment strike through a very large increase in government investment.